Dr. Lundberg teaches American literature from its origins through the Civil War, Native American literature, and rhetorical studies. Her research examines the literary representation of geology in 19th-century America. More generally, she is interested in how scientific and descriptive writing about the American West contribute to a rhetoric of national identity. 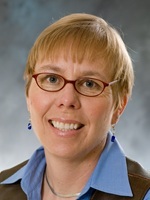 Dr. Lundberg also teaches environmental literature at the Creation Care Studies Program in New Zealand. “Casa Grande, the Ruin of Expectations” Western American Literature 42.3 Fall 2007: 222-52. “‘The Ruins of a Bygone Geologic Empire’: Clarence King and the Place of the Primitive in the Evolution of American Identity.” ATQ Special Issue: Adventure and Exploration. New Series 18.3 (Sept. 2004): 179-203. "Yosemite's Castaway Book: John Muir and the Troubling Geology of Native America." Western American Literature 36.1 (Spring 2001): 25-55. “Exploring the Linguistic Wilderness of The Maine Woods.” Reading the Earth: New Directions in the Study of Literature and the Environment. Ed. Michael P. Branch, Rochelle Johnson, Daniel Patterson, and Scott Slovic. U of Idaho P, 1998. 194-210. “Towards a Thesis-based Interpretation” Legacy: The Magazine for the National Association for Interpretation 8.2 (March/April 1997): 14-17. 2006-07 John Topham and Susan Redd Butler Faculty Fellowship Award, Charles Redd Center for Western Studies, Brigham Young University for the research project: “Uplift and Erosion: The geological origins of 19th-century American landscape, culture, and identity.” University of Wyoming American Heritage Center travel grant “Uplift and Erosion: The geological origins of 19th-century American landscape, culture, and identity.”Sabbatical, Northwestern College.